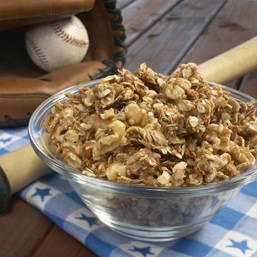 Naming granola for a baseball play may seem like a first baseman’s stretch to get that runner out on first. But since last week was opening of baseball season, it reminded me of some childrens recipes I created for the California Walnut Board. Snacks were part of an educational series of activities designed around sports and healthy life style. The granola recipe suggests three different ways for kids to enjoy granola, hence the name. A fun activity sheet was created too, take a look. Another recipe from the promotion, Banana Walnut Smoothie is still a regular favorite with my girls, along with Green Monster Dip. Hope you enjoy these recipes with some all-star fans! HEAT oven to 350°F. Spread oats and walnuts on a baking sheet that has a low rim, or use a roasting pan. Bake 8-10 minutes, stirring after 5 minutes, until the walnuts and oats smell toasted and start to brown. WHILE oats and walnuts are toasting, combine brown sugar, oil, honey and cinnamon in a large bowl. Ask a grown-up to help with this step: POUR hot oats and walnuts from the pan into the sugar mixture. Add coconut, if using. Stir all the ingredients together until evenly coated with the sugar mixture. Oats will look dry. LINE the baking pan with a piece of aluminum foil so it extends over the ends of the pan. Spray foil with cooking spray. SPREAD oat-walnut mixture onto foil lined pan. Bake 5 minutes. Remove from oven and stir. Bake additional 5-10 minutes until toasted and golden brown. Remove from oven and stir again. Cool completely on pan. Break into chunks. Lift edges of foil and pour into an airtight container or plastic bag to store. * TIP: Measure the honey in the spoon you used for oil — the honey will slip right off the spoon! Put fresh or frozen berries in a small bowl and top with a scoop of Walnut Crunch. Microwave 1 minute or until berries are warm and start to release juices. Serve with vanilla yogurt or ice cream. Increase the time by one or two minutes if making more than one dish at a time. Add fresh or dried fruit to a bowlful of All-Star Crunch. Top with yogurt or milk. Combine Walnut Crunch with raisins, dried cranberries and apricots (or favorite dried fruits) and pack in a bag for a take-along energy snack. An original recipe by Rosemary Mark for California Walnut Board. Photo by California Walnut Board.